UNUSUAL DIAMOND ENGAGEMENT RINGS : LOVE2HAVE in the UK! The BEST! 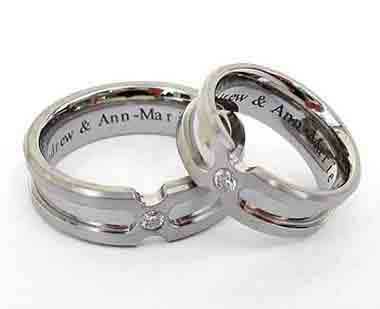 British made unusual diamond engagement rings online in the UK. When it comes to buying patterns, the most noticeable change we have seen in the last decade or so has been the metal choices for diamond rings which our customers now choose instead of gold. We have therefore seen an increasing demand for diamond engagement rings made from titanium, zirconium, steel or silver. For our online unusual diamond engagement rings section, we have listed together our incredible diamond engagement rings for men and women. The unusual models featured here all come in these different metals, but all possess one thing in common - unique designer styling. You won't find anything like this on the high street! We can not only provide the BEST unusual diamond engagement rings made here in the UK (and probably the world) but also at the LOWEST PRICES too. If you think you may have seen the same unusual diamond engagement ring elsewhere at a lower price, let us know, and we will price match like for like. YES! We can BEAT anyone!